As the 26th anniversary of the 88 massacre and crackdown approaches, Burma Campaign UK today launches a campaign calling on President Thein Sein to publish his full army record and reveal his role during this time. 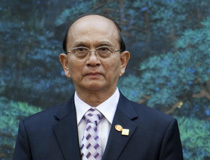 When he became President, Thein Sein described the massacre and crackdown as having ‘saved the nation’. Burma Campaign UK is asking people to email President Thein Sein, asking him to publish his full army record, including the role he played in crushing the uprising in 1988. The people of Burma have the right to know the past actions of the President. The email action is online here. President Thein Sein has been praised by the international community, including the British government, as a reformer. Yet horrific human rights abuses have continued under his rule. Now that sanctions have been lifted and aid and trade is flowing into Burma, reforms are going into reverse, with new crackdowns on media freedom, a doubling of the number of political prisoners, and increased repression against the Rohingya ethnic minority. Burma Campaign UK’s briefing paper on President Thein Sein is available here.